Attorney-General has decided to rehabilitate the Swedish diplomat Raoul Wallenberg and his driver Vilmos Langfeldera. This RIA Novosti reported in the Office of Information and Public Relations Prosecutor General’s Office. After verification, prosecutors concluded that the two Swedes « were repressed by Soviet authorities for political reasons. » In this regard, they are subject to a Federal Law « On Rehabilitation of Victims of Political Repression on Oct. 18, 1991. Swedish diplomat Raoul Wallenberg was arrested by Stalin’s regime during the Second World War. He worked at the Swedish embassy in Budapest. Using diplomatic status, Wallenberg saved the Nazi-occupied Hungary, Jews who were sent to concentration camps. He gave them Swedish passports, hiding them in the imaginary Swedish missions, bribed and intimidated the occupation authorities. Last colleagues saw Raoul Wallenberg 17 January 1945, when he went to meet with the commander of Soviet troops in Budapest. Initially, the Soviet Foreign Ministry claimed that Wallenberg is under the protection of Soviet troops. Then, in a personal note, Ambassador of Sweden, on August 18, 1947 reported the death of Wallenberg in Budapest during the battle for the city. 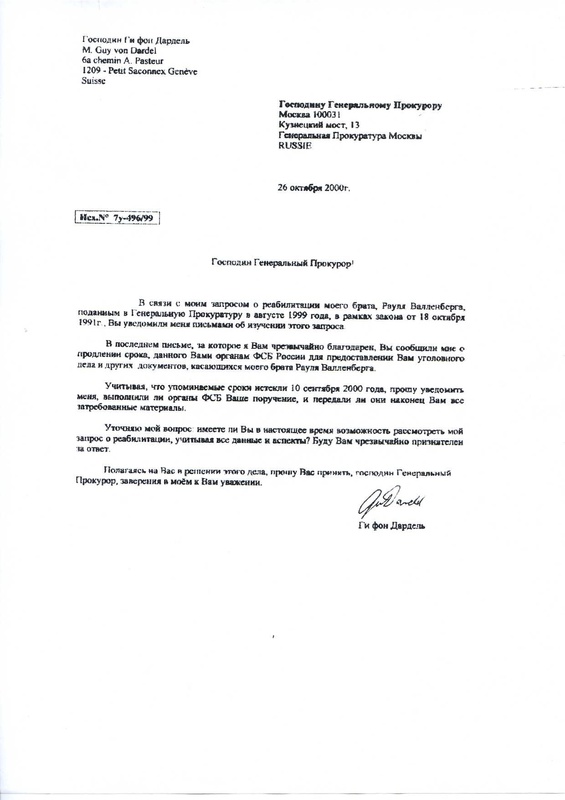 Chairman of the Presidential Commission for Rehabilitation of Victims of Political Repression Academician Alexander Yakovlev believes that repressed by Stalin’s regime during the Second World War, a Swedish diplomat Raoul Wallenberg will be rehabilitated by the decree of Vladimir Putin in the near future. It is officially confirmed that his committee has a decision this fall about the necessity of rehabilitation Wallenberg as victims of political repression. » « After that I immediately sent a letter to the Prosecutor General’s Office and told of our decision to the president, » – said Yakovlev told Interfax on Monday. « We must finally put an end to this story, which became sharp international and long poisoned the atmosphere », – said Yakovlev. According to him, despite the fact that Wallenberg had been convicted by a court for political reasons, the legislation allows the RF to rehabilitate him as a victim of political repression. All the circumstantial evidence confirms, that Raoul Wallenberg died, or most likely was killed, on 17th July 1947. Practically all the direct evidence was destroyed at the time. In the course of thorough investigative work, evidence was examined relating to the detention and arrest, or any other aspect of Wallenbergís time in prisons of the former USSR national security system. More reliable information was not found. The responsibility for the death of Raoul Wallenberg lies with the USSR government leaders of the time, since no other authority at the time could be in charge of the fate of the Swedish diplomat, representing a neutral government, a member of the ëWallenberg Houseí, both well known abroad and known specifically to the Soviet leader, Stalin. Individual blame as a ëcollaboratorí in this crime is carried by Abakumov, as the executor and key figure in the organisation of the physical removal of Wallenberg and the concealment of its evidence, and by Molotov, Vyshinskii and Dekanozov, providing foreign policy protection for the matter. Furthermore, there are weighty grounds for supposing that Molotov knew about the arrest and death of the diplomat, and moreover that, holding a responsible position, he slowed down the process of exposure of the committed crime. The conclusion therefore follows that the Soviet leadership as a whole were not keen to go into open discussions with the Swedish side It must be admitted that in ëcold warí conditions, the distrust was mutual. Both sides had to take a complicated path, before they began to leave their distrust of each other in the past. The start of the process of exposing the crime was set up by the processes of democratisation in Russia. In the latter, the fundamental principle was the clearing out of obstructed channels that had been started at the end of the 1980s. The Russian part of the joint Russian-Swedish group consider the task faced by the group to be resolved, and presents the results of its work to the leadership of the Russian Federation and Sweden. We believe that the work carried out can be of interest to the public. Andras Tamas, Hungarian soldiers in World War II, the story went around that all the world’s media, he returned to his homeland. Last weekend, accompanied by the Hungarian diplomats, senior doctor at a mental hospital Kotelnich Yuri Petukhov and a representative of the Hungarian National Institute of Psychiatry and Neurology Ákos Worth he arrived in Budapest. On the bank of the Danube Tamas immediately recognized the landscape and said: « It’s Gellért Hill! » Memory of the patient, which for decades was considered hopeless, returned quickly. In any case, when the Airport before the flight he was offered the mineral water, he said that he would prefer « pálinka » – Hungarian vodka. At home Tamás be a two-month rehabilitation at the Institute of Psychiatry.Then he settles in a nursing home or in one of the 20 families who volunteer to take the old man. Announced and relatives – an elderly lady with three grown-up daughters says that she recognized in Tamas her husband. « Ever since Soviet troops abducted Raoul Wallenberg in Budapest in January 1945, his life work and fate have captured the imagination of many people in many countries. Largely because of this, he still attracts as much attention as he ever did.